Wednesday 4/17: Got to Nobscot for the first time this year, not sure it was worth the effort. Couple Winter Wrens, 3 towhees, Fox Sparrow, and not much else. Thursday 4/18: Fox Sparrow, gnatcatcher about it at BBN. Friday 4/19: Day off, so went down to Westport. Knew it would be windy but hoped that would have things moving. Scoters were, not much else. Started at Gooseberry, where I had a couple Dunlin and Sanderling then watched scoter flocks go by for an hour. Also finally got gannet for Bristol. Moved to Allen’s Pond, which was quiet (and I only managed the road side of the beach trail as it was too windy on the beach side). Got county #2 on the day with Black Vulture by the pig farm. Poked around a bit, then stopped for lunch. Egypt Lane was next. Flock of Brant was ok as was a kestrel. Continued to West Island. Walked a lot of the trails and couldn’t find anything. Turkey along the road on the way out was #60 on the day. Saturday 4/20: Got up for the Menotomy walk (thanks mockingbird right outside the window) but decided a pond check was a better idea in the rain. Loon on the res, loon on Flint’s. Continued to Great Meadows as it started to clear. Couple Bank Swallows mixed in and a yellowlegs or two overhead. Looped the woods and it started pouring again. Tried School St but too heavy to scan. Rain slowed again, so towards Arlington Res. Usual there, 2 Spotted Sandpipers the best. Gave McClennen a quick check, nothing, and nothing at Spy Pond. Sunday 4/21: Started at BBN. Patch FOY towhee, yellow-rump, and Savannah Sparrow plus another Virginia Rail, a Purple Finch, etc. West Meadow was more of the same, as was the duck ponds. Decided to try Kendrick Lake in the drizzle, found next to nothing. Loon still at the res on the way home, not a whole lot else. Monday 4/22: Heard Pond was pretty quiet, pair of bluebirds the most interesting. Tuesday 4/23: Bit rainy. Too much traffic for the res, street sweeper in the way by Flint’s. Nine Acre had 2 teal still in a quick scan. Heard Pond was dead. Waxwings, FOY Chimney Swift, lots of swallows at the Pelham Island Rd bridge. Wednesday 4/10: Pine, Palm, and Yellow-rumps at Great Meadows but not a ton else. Thursday 4/11: Usual at BBN. Friday 4/12: GW Teal and Ring-necks were new for me at the Wayland Community Gardens but no Blue-winged and little else. Nothing nearby either. Did have an Osprey over the office. Saturday 4/13: Led an MBC walk at BBN. Only one person braved the rain, which tapered off quickly. Fox Sparrow, 6+ Rusties, and a patch tick. After that, I wandered Concord Ave hoping the teal dropped in. No luck with that but did have a Virginia Rail, snipe (both new for Belmont), and a few warblers. I continued to Arlington Res, where the early Spotted Sandpiper was still around. Revere Beach was next, Manx Shearwaters were easy but no shorebirds. Continued up to Lynn Beach but no luck there either. Stopped at Station Landing on the way home, an American Lady was my first butterfly of the year. Sunday 4/14: Decided it was sunny enough to look for butterflies at Assabet. More or less clouded up by the time I got there but 2 azures and a Mourning Cloak plus 2 sapsuckers, singing Hermit Thrushes, etc. Stopped at Flint’s (loon) and Waltham St (kestrel and Savannah Sparrows plus a snapping turtle) on the way home. Monday 4/15: Started with a check of the res and Flint’s after the rain stopped. Nothing at either, probably should have gotten out an hour earlier. Since it was nice, I headed to Mt. Auburn and figured if it got crappy I’d check Fresh Pond. Tons of kinglets and Hermit Thrushes and a few sapsuckers plus an Osprey. It stayed nice, so went to look for the RB Mergs by the Watertown dam. No luck with those but had a Spotted Sandpiper. East of the dam had a Pine Warbler but not much else. Absolutely nothing at the duck ponds. Since there was another storm, checked the res again and had 4 Red-necked Grebes. Tuesday 4/16: Gnatcatcher and Barn Swallow among the arrivals at College Pond plus first for Weston Fish Crow. Wednesday 4/3: Not so nice out, Greater Scaup, a few mergs, and that was about it at the res. Gave the egret another pass and it was very obvious even without stopping again. Nothing at Heard. Thursday 4/4: Rusty Blackbirds besides the patch additions at BBN. Friday 4/5: 6 Evening Grosbeaks at Dunback plus a Red-shoulder. Saturday 4/6: Hanscom had 3 Field Sparrows, a kestrel, and a meadowlark. Decided to look for Black Vulture from Prospect Hill with no luck but did have 3 Pine Warblers hiking back down. Sunday 4/7: Started at Alewife, which was quiet beyond a Palm Warbler at Thorndike. Continued to Torbert MacDonald, which had a kestrel (finally for Medford) and Draw Seven which was a waste. Back to Sandy Beach, which was quiet. Lower end of the lakes had 4 Red-breasted Mergansers. Nothing at Meadowbrook or Hobbs Brook. Monday 4/8: Too rainy. Usual at Hardy, snipe at Nine Acre, 2 scaup at Heard would have been good if they were close enough to ID. Tuesday 4/9: Couple Virginia Rails at Forest Grove but not much else. Wednesday 3/27: Purple Finches at Lot 1, Rusty over the West Meadow. Thursday 3/28: Snipe at Kaveski but missed the Gadwall and a meadowlark at Elm Brook. Friday 3/29: PB Grebe plus first for Framingham Bufflehead at Farm Pond. Saturday 3/30: Decided to do a Worcester county swing. Got 5/16 targets, which was pretty good considering several were only reported nowhere near where I actually went. First stop was Bolton Flats. Ran into Neil walking out, who had just had a shrike. No luck with that, but we stood there for a good 3 hours. Unfortunately most things were in flight but we had thousands of blackbirds, hundreds of ducks, one of the Sandhill Cranes (which I figured were long gone), a meadowlark (saved me a trip elsewhere), and some snipe. It eventually slowed down, so I moved on to Wachusett Res where the Surf Scoter was obvious. Tick and run to Sterling Peat. Wasn’t a whole lot there but a Pine Warbler was foraging above the car as I was read to leave, so I got 5 warblers in state before April. Sunday 3/31: FOY Harrier and Virginia Rail at Great Meadows. Early afternoon check of Arlington Res had an early Rough-winged Swallow but little else. That was #99 for the year, so I checked Waltham St., Hardy Pond, and the res without finding #100. Monday 4/1: #100 was the Ospreys at the nest at Knox Trail. Raven there, nothing at School St. Too windy everywhere. Tuesday 4/2: Buzzed Elm Brook again and got the Gadwall finally. Gave the Old Rt. 27 bridge a few minutes and saw next to nothing. Drove off and thought I saw an egret on the pond on the other side of the golf course. Doubled back and didn’t see it, but since it was there Wednesday I’m calling it. Nice early date. Wednesday 3/13: Heard Barred Owl and siskin at College Pond. Thursday 3/14: Finally got the Red-shoulder at Kaveski, along with a few redpolls. Friday 3/15: Nothing exciting at Rock Meadow or the duck ponds. Saturday 3/16: RN Grebe was still at Horn Pond, along with 2 Tree Swallows and a Fox Sparrow. Usual at Sandy Beach. RT Loon and Great Cormorant down the lakes. Nothing at Draw Seven. Red-shoulder at Arlington Res along with a few ducks but no sign of yesterday’s yellowlegs. Four Turkey Vultures on the way home. Sunday 3/17: Did a Plymouth county run. Probably should have waited for a week when it was less windy, but it was tolerable. Ellisville Harbor was fairly quiet, minimal at Manomet Point. 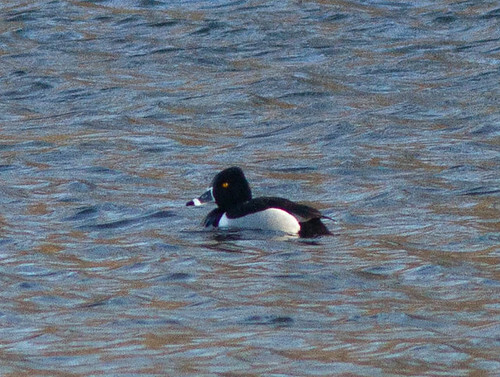 Pair of Barrow’s Goldeneye at Great Herring Pond, then I worked my way west. Greater Scaup and a Fox along the bay, then a few expected county birds at the goose fields (but no good geese). Several other unproductive stops, although phoebes at a few places were my first of year. Monday 3/18: Had to take the car in, so just a quick buzz of Nine Acre (nothing of note) and Pelham Island Rd (ditto). Looped a bit on the way home, Heard Pond was opening and had a bunch of mergansers. Nothing new on Pelham Island Rd until I drove off and had a Pileated fly over. Res open a bit, just mergansers though. Tuesday 3/19: Grosbeak and 3 crossbills at Dunback plus a Rusty or two. Wednesday 3/6: Got the grackle in the yard I missed the other day. Quick check of Nine Acre and Pelham Island Rd didn’t have much, Ring-neck on the river about it. Thursday 3/7: Nothing of note at BBN. Eagle over Lake Cochituate on the way to work. Friday 3/8: Quiet at Great Meadows, a few displaying goldeneye. Saturday 3/9: Wandered Assabet a bit looking for finches. Got a few siskins but not much else. Buzzed Nine Acre and School St which basically had nothing before deciding to wander Dunback a bit. Monday 3/11: Killdeer at Wayland Community Garden. Tuesday 3/12: Eagle at Forest Grove. Surprised no Wood Ducks, but 8 further up at Norumbega. Not a whole lot else.